I wonder if anyone tried using steadicams with micro43? It should or should not make sense given our lightweight bodies. I bought a Glidecam pro 200 after Manfrotto's 585 modo didn't work completely (you can have your camera balanced when you are standing still only). So what are the options? I heard somebody was using Glidecam HD1000 with better results. It does have better controls for setting up the weights. It is important because one can't spend 2 hours balancing the system before going out to shoot. So if anybody is able to share his experience on this matter — please do that. Btw theoretically speaking which camera is easier to stabilize: heavier or lighter? My GH2 with 20mm pancake weighs almost nothing, but I can't say it helped. It is easier to stabilize heavier camera as it will have more inertia and the balanced system will have more inertia still. I am using black bird camera stabilization system with my gh2. It works very well and is easier to use than the Glidecam systems. The tripod shots were done with 2x Canon XHA1 HD camcorders, and all the location and other handheld shots were done on the GH2 with no stabilizer, using the 14-140. The IS on the 14-140 is very good I think. You do need a lot of care when using the Blackbird - for example, you have to work out what height you are going to use the camera, hence the orientation of the flip-out LCD, because the position of that has a huge effect on balance. I could have done that shot without the Blackbird but it would have been difficult. From experience it is quite hard work using a stabilizer. And yes, it needs practice in walking smoothly etc. As a musician I think of it like buying a very good instrument - it won't make you play better but will give you the 'possibility' of better. By the way , the weight of Blackbird / GH2 / 14-140 is fine. A stabilizer that's too heavy is very hard work after a while (the XHA1 is 5.5lb / 2kg, which is hard work!). The GH2 is a really good pairing with stabilizers: look up my other videos on vimeo because there's an extended 2 mins-ish test with GH2 / Blackbird as well. I bought Flycam nano for GH2. Here's my first test with this combo after few minutes initial balancing. Just to mention that I don't have any previous experience with steadycams. That's nice. I think the balance is an issue, though - the camera should be perfectly balanced (so you have to keep the camera vertical on your own - if the stabilizer is keeping the camera upright, it's not balanced, and it will "pendulum" about when you move). I'm not claiming mine is perfect either, as the balance is a bit bottom-heavy on that shot in my video. The other thing I'm sure you've discovered, is that you have to plan the moves very carefully, and look in three places at once! Stabilizer not must be balanced so you'll have to keep camera vertical. It must return from horizontal position to vertical in about 1-3 sec by itself (this is called drop time). Different people prefer different time, also it could depend on model. @Vitaliy Yes, you are right - sorry, I realize it must return to vertical even if slowly. I just got a blackbird. It works well with gh2 with 14-140 lens. It is on the verge of being out of control with 20mm pancake. It's stable vertically but has side to side sway here and there. They are sending me a shorter tbar to try for the lighter setup. It works well with my pan150. But god that's heavy. I've just ordered the flycam nano.. seen and heard a lot of good things. will post impressions when it arrives. am factoring in 5 hours to balance the damn thing, but, for the price, it appears to be the only drawback and one that should only frustrate the first time out! I have the flycam nano, and I think it's great for the GH2. Much better than the Hague MMC, which I also have. I have had little trouble balancing it on the GH2. If you do the drop test, you want about 2.5 seconds. Best idea is to get an adaptor plate so you can just snap it in, and you're ready. Then, you don't have to balance every time. 5 hours!? It took me about 15 minutes to balance the GH2 on the flycam nano. Make sure you watch a video on youtube if you are having trouble. You must realize that Adobe's marketing makes certain things look way better than they really are. I have been playing with CS5.5 for the last week and you may trust me, that while the technology is short of a miracle it is very limited in it's application. Also it is painfully slow even on a fast computer. You always want to get your footage as good as you can long before it hits the post. Do not get rid of your camera stabilization system. Let me chime in and say I'm not a very happy flycam nano user with the 20mm 1.7. I got some reasonably good results but it's a huge pain to balance and when you do, you're either not properly balanced statically or dynamically. I'm gonna give it one last chance when I get my hands on a different, longer on the front and heavier wide lens like the 14-140 or samyang 14 2.8 (neither of which I own:( ). About cs5.5 warp stabilizer: it looks amazing, mainly because of it's ease of use compared to the usual method and it's one of the main reasons why I'll upgrade. Great tool to have. But I don't think anyone with a basic understanding is going to rely exclusively on warp and expect it to be like steadicam:) you're not gonna fool anyone. All it does is it adds another layer of stability if you need it. If you were using a shoulder rig and you want it to look more stable, you now have an easier solution. If you for some reason had to go handheld, and you have awful footage, you might just get some usable shots. For me, the main thing i'm looking forward to see how it works is the shoulder rig + warp stabilizer combo. If it gives me the amount of steadiness I want, I will hopefully be using a bit less of the steadicam which I despise balancing, I can't be quick with, can't monitor with, can't focus with, can't improvise with, can't get good audio with, can't change lenses on the fly with but in some occasions(hopefully fewer with warp), can't live without. A lot of wisdom from dkitsov - I totally agree that it's better to get it right in the camera. I think it's useful to understand how stabilization software works, because it gives a clue as to why software isn't always the answer. Simple software will work out the camera motion by tracking a few objects in the scene, then tilt, rotate and laterally move the picture to cancel out the camera motion; more sophisticated software builds up a map of the scene objects in 3D space, calculates the lens angle, and then warps bits of the picture to compensate for camera movement. 3D calculation gives better results in travelling camera shots, for example where the camera moves around a central object. Whichever software you use, the more stabilization you choose, the more the software has to "move the image around" to cancel the camera movement, leaving occasional black edges around the frame, so it also has to zoom in to the processed image just enough to crop out the moving black edges. Because of that zooming, you lose resolution and also slightly negate the effect of the stabilization. There are other effects which look odd: for example, if there's a blurred frame in the middle of a sequence while the camera is moving, your eye will accept the blur because that's what happens when the camera moves. If that same sequence is stabilized, you will get a blurred frame in the middle of an otherwise stable sequence, which looks quite unnatural. For all these reasons, as dkitsov says, it is always better to get stable footage while capturing if you can, for example with a stabilizer and with a wide lens angle, and use software stabilization only if you really need to. It's not all bad. You can get away with software stabilization in short shots with a strong single visual point of interest, because that will temporarily distract you from the overall loss of detail in the stabilized shot. Instead of stabilizing, you can also try slowing down unstable footage, which can be very effective if it's appropriate to the video / subject (for example a handheld shot of a static object). There are at least 11 (eleven!) slowed shots in my Vimeo video in my earlier posting. Also, the tracking shot at the opening is actually a composite of four stills, which is then panned in the editing software. I fully agree to points rised here. You need to have good steadicam and, more important, learn to use it. Learn to balance the rig, make fast rebalance on lense change or zooming. Understand how you must change your walking. And all people I had talks with recommend to buy proper west. Because after short periods your hand become tired and footage won't be so smooth. This thing add weight and saves your time during balancing and rebalancing. Seriously, all in one take (no cuts)... Awesome! A few clipped heads here and there but overall very professional - top notch! 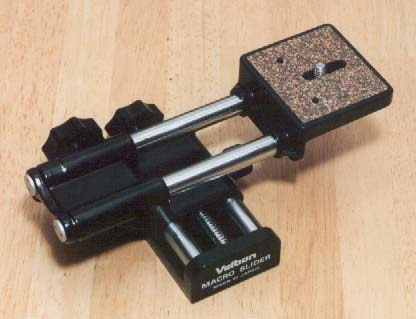 BTW, a good set of macro rails might help with balancing without the need to turn any bolts. I use the Velbon rails myself - picked up a set for $20 at the used camera shop. Ok. So I exchanged my Glidecam Pro 2000 for HD1000 today. The difference couldn't be more dramatic. HD1000 is at least 2 times lighter and easier to use. It took me about 30 minutes to balance it for the first time with 14-140. And I'm only starting to learn the craft. It's been proven that shaken video produces lower bitrate in GH13. But it seems a lot of work to do careful balancing on a steadicam each time. I mean... swiveling LCD could throw out of the balance. Can the continuous autofocus on 14-140 throw it out of the balance? How about a mix of a bit hardware and a bit software solution? Interesting about the continuous autofocus. Keeping the lens wide with fixed focus and fixed aperture works best in steadicam shots in my experience. Any slight image correction (for example moving across an area where the lighting changes) can be done in editing - unless it's severe change of lighting, in which case yes, use auto exposure. With a planned steadicam move and a wide lens you should be able to work with fixed focus. A slight loss of focus while the image is moving is not going to be that noticeable, as long as the static parts of the shot are in focus. Could you explain why the Manfrotto 585 doesn't work with the GH1?